Lowers the rear suspension 1.2"inches , also the seat height is reduced simultanceously. By lowering the rear suspension rear wheel traction increases and the center of gravity becomes lower. The lowering kit is also suitable for shorter riders who otherwise may have to tip-toe on a standard height Fazer 8. 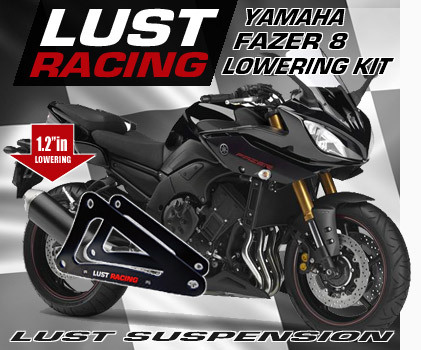 The Lust Racing Yamaha Fazer 8 lowering kit is designed, engineered and manufactured in UK. Made in roll forged steel, finished in black powder coating wiht Lust Racing logo in silverchrome and red. Supplied with installation instruction.